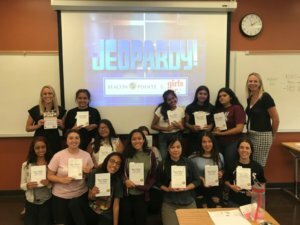 Karisa Diephouse, Julie Johnson, and Jamie Cardona of Beacon Pointe Private Wealth Advisors had the great pleasure of presenting to Girls Inc. of Orange County at their summer program, Eureka! Eureka! Is a four week long intensive enrichment program for girls who are currently in 6th-9th grades. The goal of the program is to expose girls to various STEM (Science, Technology, Engineering and Mathematics) careers in the hopes that they will become interested in those fields in college. 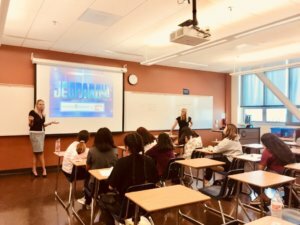 Karisa, Julie, and Jamie discussed jump starting personal finance with topics such as budgeting and saving money made through allowances and first jobs. Topics were taught through a rousing interactive game of Jeopardy. Each attendee was also gifted a copy of our international best-selling book, Your Dollars, Our Sense: A Fun & Simple Guide to Money Matters. Our team was invited back to another Girls Inc. event for their Youth Empowerment and Self Sufficiency (YESS) Program. The YESS Entrepreneurship Academy is a place for girls to learn leadership, economic literacy, and business skills by creating their own mini-society and opening up their own businesses. This event gave the girls the opportunity to learn about being an entrepreneur, starting their business, deciding what to sell, and how to price and market their product and/or service. Girls Inc. of Orange County has been a respected member of the non-profit community since 1954. The mission of Girls Inc. is to inspire all girls to be strong, smart, and bold. They put their mission into practice through the Girls Inc. experience that equips girls to navigate gender, economic, and social barriers and grow into healthy, educated and independent adults. We are proud to support these young women as they begin their own paths to personal finance and we support the growth of their many skillsets!